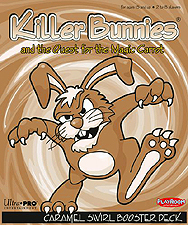 Drenched in sweetness, new and delicious, the next Killer Bunnies Booster Deck is witty and auspicious! Caramel Swirl adds 55 cards to your existing set plus a Brown 12-sided die. Other alluring cards include the feminine forces of the Verminator or Omega Mu and Johnny Wishbone to test psychic abilities for you. Funky Fungus affects a weapon card and the Sacred Chalice gives you a financial vanguard. Cherry Cordial will keep the game clean but Alternate Uhura will prove quite mean. The most powerful bunnies will take note when you play the card Island Vote. You might say "Fuff", and you might say "Ew", when you're asked to play Smell That Shoe! Do yourself a favour, treat yourself to an all-new flavour, take the new deck for a whirl, the delicate and delectable Caramel Swirl! Compatible with any Quest Blue Starter Decks (with any Booster Decks).